Cape Schanck is located at the southern tip of Victoria’s Mornington Peninsula. The beaches here offer a feast of opportunities for photographers. 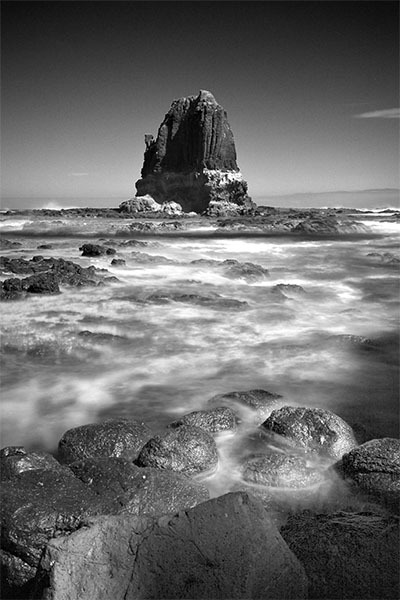 At the tip of the cape sits Pulpit Rock, a huge monolith standing proud amongst tidal rocky platforms. At low tide the rocky platforms are exposed allowing fairly easy access to a large number of rock pools. These pools are home to a variety of sea creatures including small fish, crustaceans and octopuses. Depending on the time of year the pools can contain various forms of brightly coloured seaweed, providing wonderful hiding places for the rock pool residents. This is a great place to dunk your waterproof compact camera if you’re lucky enough to own one. Unfortunately I don’t own one (yet). The beach leading out to Pulpit Rock is covered by rounded rocks that roll around and pound into each other with each wave creating an interesting sound that’s quite difficult to describe. Below – Cape Schanck Lighthouse overlooking the west side of the cape. Below – Cape Schanck East. The eastern side of the cape provides a rocky beach where there are lots of opportunities for the photographer who enjoys capturing waves crashing over and around rocks. I took quite a few long exposures here. Below – The Schanck. The white surf and dark rocks contrast each other nicely and provide excellent material for making great black and white images. This entry was posted on December 4, 2010 by Jim Worrall. It was filed under Australia, Australian, beach, black and white, landscape, landscape photos, long exposure, mist, monochrome, mornington peninsula, motion blur, photo website, photographer, photography, pictures, rock pools, seascape, Uncategorized and was tagged with Australia, Australian, beach, black and white, Cape Schanck, HDR, landscape, long exposure, mist, monochrome, mornington peninsula, motion blur, ocean, ocean beach, photographer, photography, photos for sale, pictures, rocks, rockscape, seascape.